No matter how many times you’ve said goodbye to your college kid on their way back to campus, parting is rife with mixed emotions: excitement for their college career, along with potential loneliness if you’re returning to a much quieter home. However, your role as a parent can still mean providing invaluable assistance — including navigating the financial aid world to ensure that your student not only gets into college, but stays there. We’ve previously covered how to help your high school kids with the scholarship search, but what if your student is already deep into their first (or second or third) year of college? Here are five more ways to help your current college student find scholarships, even from afar. Encourage involvement. 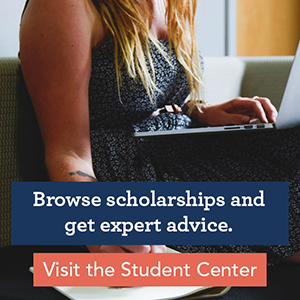 College presents a slew of new activities, and those experiences are full of opportunities for your student to search out scholarship applications. If you have a child that’s part of the Greek system, fraternities and sororities often offer national and chapter-specific awards for members. Being involved in campus activities could lead to student leadership scholarships like those offered by the National Association for Campus Activities, both for undergrad and grad students. And the volunteering that your student did in high school could carry over to college scholarship applications that favor community service, such as local Lions Club scholarships. Discuss financial expectations. How much will you contribute to your student’s tuition and fees? If family contributions aren’t possible, how much of the tuition will your student need to cover each year? Answers to questions like these will help clarify family financial expectations, especially in conjunction with your annual FAFSA. And having these conversations early in your student’s college career (or before) will help them realize the huge difference that scholarships can make in reducing sticker shock once the first bill hits their inbox. Take into account academic schedules. You’ll want to encourage your son or daughter to look for scholarships often, but it’s hard to make that happen when there’s a 100-page reading assignment looming the next day. As mentioned above, being involved in campus activities could present a variety of scholarship opportunities. But if your son or daughter is struggling with balancing activities and classes, there are a number of scholarship opportunities right on campus to take advantage of; a visit to the financial aid office can include obtaining a list of university-wide scholarships, and an introduction to department heads demonstrates initiative and interest in major-specific awards. Juggling coursework and the scholarship search don’t have to be at odds with each other — your student will have to hit the books, but that dedication could also lead to more scholarships dollars. Become a student of the financial aid process, too. Financial aid requirements change over the years, and FinAid estimates that tuition increases about 8 percent per year. The more that you know about financial aid, the better you’ll be able to help your student. For instance, your student may need a gentle reminder to complete their FAFSA, which they need to complete — with your financial input — every year they’re in school. Parent sections of college websites like StudentAid.gov and BigFuture include lots of helpful information, as do groups like College Parents of America and parent associations on campus. We’ve also covered financial aid basics, first-generation FAFSA advice and unmet need on this blog. Respect the maturation process. Having a child in college means development into adulthood, and part of that transition includes more freedom and less hand-holding in the scholarship search. Since your college student is capable of searching for their own awards, not overtaking the process can go a long way in maintaining healthy boundaries. However, while your student may not want you calling them every hour, part of growing up may mean your student still needs to learn how to ask you for help. This is where sharing resources comes in handy: posts on topics like scholarships beyond freshman year and scholarship tools could be motivation for them to start — and to keep — applying. Above all, being supportive in the scholarship search will help encourage your student to make the effort to complete applications. Every dollar received makes a difference. And together, the college journey will help both of you grow.